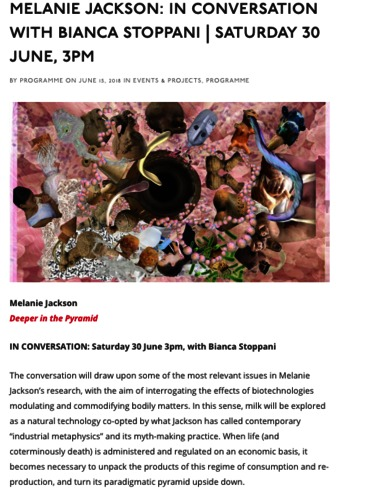 Jackson, Melanie and Stoppani, Bianca, 2018, Conference or Workshop, In conversation: with Bianca Stoppani at Deeper in the Pyramid, Nottingham, UK, 30th June 2018. 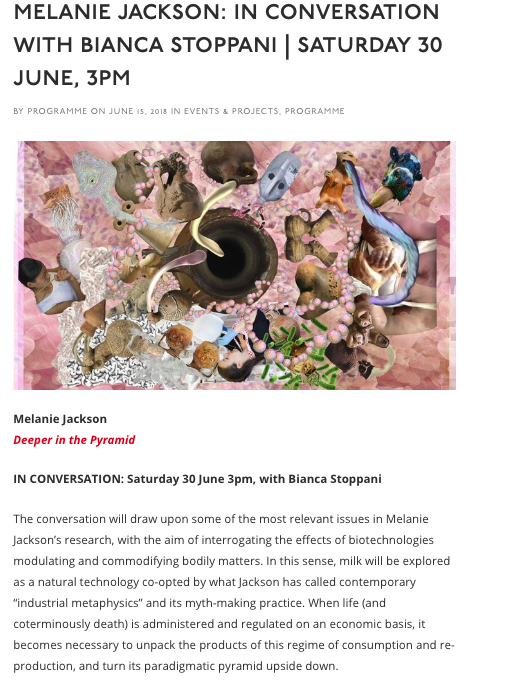 The conversation will draw upon some of the most relevant issues in Melanie Jackson’s research, with the aim of interrogating the effects of biotechnologies modulating and commodifying bodily matters. In this sense, milk will be explored as a natural technology co-opted by what Jackson has called contemporary “industrial metaphysics” and its myth-making practice. When life (and coterminously death) is administered and regulated on an economic basis, it becomes necessary to unpack the products of this regime of consumption and re-production, and turn its paradigmatic pyramid upside down.